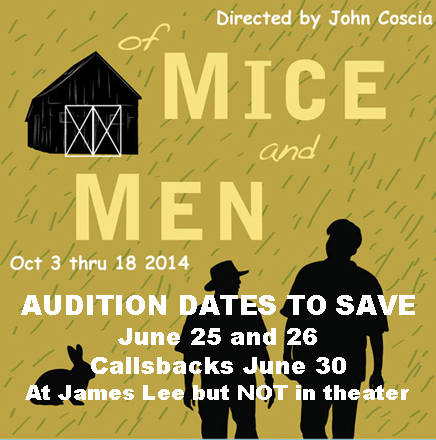 This is an early “heads up” on the audition dates for PPF’s 2014-2015 season opening production “Of Mice and Men“. If you think you would like to audition, please mark the dates on your calendar. The full audition announcement, audition process, character descriptions, production schedule and other information will be posted and emailed in the next 10 days or so. There are 9 men, 1 woman in the cast and ALL ROLES ARE OPEN. Audition Dates: Wednesday, June 25 and Thursday, June 26 for initial auditions, Callbacks, if necessary will be by invitation on Monday, June 30th. Audition Times; On June 25 and 26, auditions will be held from 7 PM to about 9:30 PM as needed. NO APPOINTMENTS are required. Please plan on arriving as close to 7 as possible. The audition process is still being finalized but will most likely consist of readings from the script. You can anticipate being up and down multiple times during the audition in various characters and in combination with multiple actors, so, if at all possible, please plan on staying for the evening. All 10 roles (9 men and 1 woman) are open. Of Mice and Men will be be performed between October 3, 2014 and October 18, 2014 for 10 performances plus a student/senior preview dress on October 2. Stage rehearsals will begin September 2nd and will be held most weekday evenings (there are some breaks) from 6:30 to 9:45 PM and on weekends during the day. SOME pre-stage rehearsal, read-through and other work will be scheduled in July and August based on actor availability. The July and August schedule should not be intensive. PPF is a non-profit community theater troupe and does not compensate actors. PPF is a membership organization (membership costs $10 for a year) and is NOT required to audition but is required if cast. As a general rule, if space is available, all auditioners will be allowed to watch all auditions. We try to make our auditions as fun and stress free as possible. Please watch our website www.providenceplayers.org and/or our Facebook Group for addition information as it is posted.